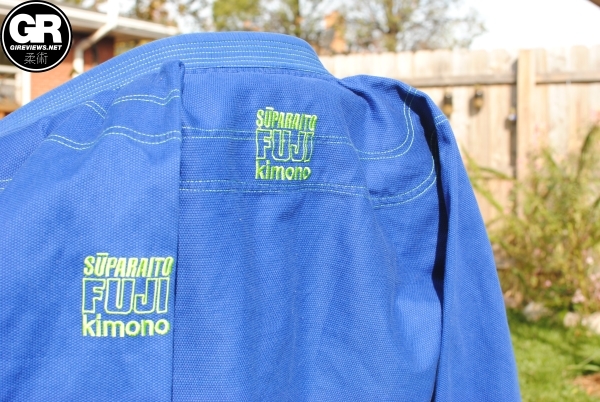 My first, and only experience with Fuji prior to this review was with their single weave basic gi. It was my second gi (ever) and I loved it dearly. It shrank like crazy over time (as did a lot of those older models), so I was pleasantly surprised by the Fuji Suparaito! 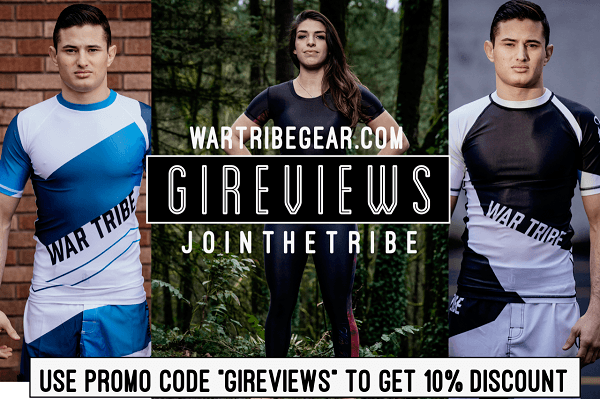 It’s a genuinely lightweight gi and a lot of fun to wear and train in. 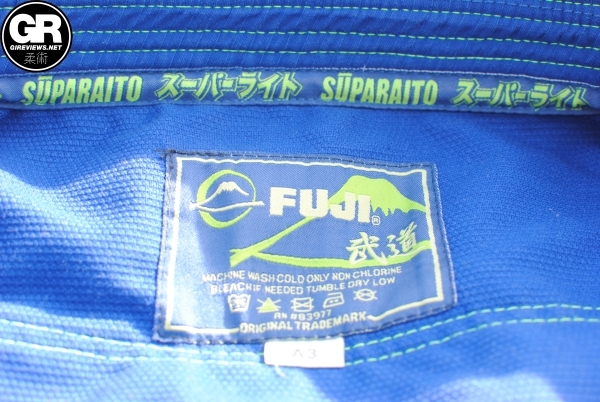 The Fuji Suparaito (Super Light) is Fuji’s lightweight offering in their line of competition gis. Some people prefer heavier weight gis and others lighter weight. 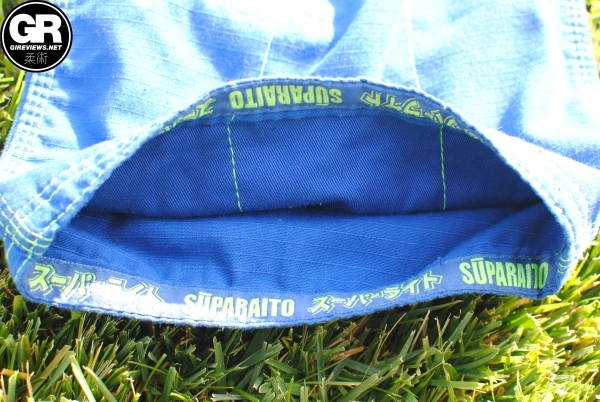 While I’m normally in the heavyweight gi camp, it was a pleasure to be able to wear and review the Suparaito. I found the fit to be absolutely fantastic on the Fuji Suparaito. I’m 6’1 and about 210lbs. and the A3 fit me wonderfully. 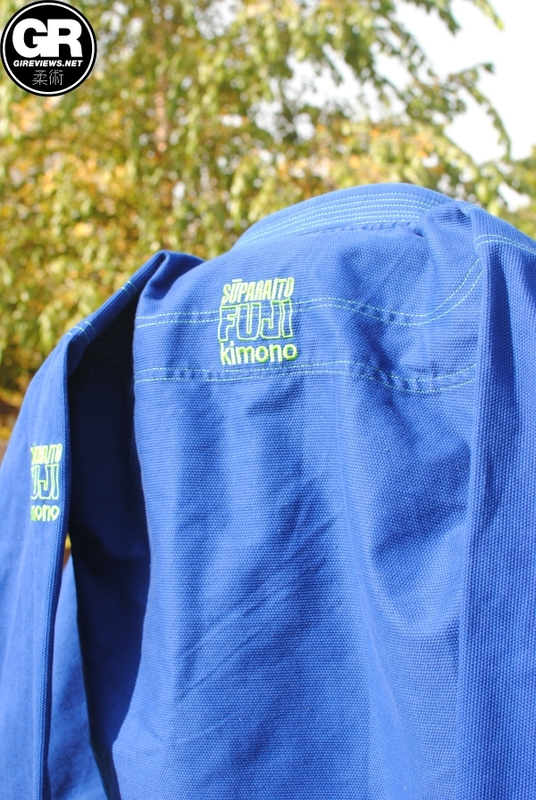 I’m a big stickler about the lapels closing cleanly across the front of the gi and they were great on the Suparaito. It was very fitted across the upper chest and back and while it didn’t restrict movement, it didn’t feel like there was any unnecessary material. Going by the measurements, you can see the narrower cut across the midsection, and a bit shorter sleeves compared to other A3 gis. I prefer that for a more competition cut. The trousers also fit great and didn’t restrict my movement at all. The pants are about 2-3″ shorter than most A3 gis, like my Bull Terrier New Star. Also, the pant cuffs are a bit wider than my Meerkatsu Heavenly gi, but narrower than my War Tribe gi. While I’m not in love with the blue-green design, I like how the embroidery and taping on the gi. There is taping along the inside of the jacket as well as along the outside skirt. I’m normally not a huge fan of taping on the outside of gis, but it’s fairly low-key on both the blue and white versions of the gi. The lightweight pearl weave jacket is fantastic. The collar is covered by ripstop material with extra rows of stitching. The bottom of the skirt is short and tapered and great for defending against lapel guards and the like. I felt like the collar was pretty solid. Much more solid than other lightweight gis I’ve tested. As noted above, the fit was fantastic for me and the jacket was great to roll in. 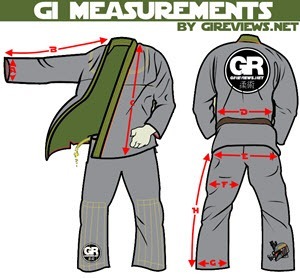 The gi is full reinforced so I was never worried about it ripping during training, despite its light weight. There is also taping, as noted above, on the inside of the sleeves but it was not scratchy at all. The trousers feature a minimalist 4 belt loops that are set low enough to do their job as I had no issues of the stretchy cord drawstring belt riding up during training. The pants also have extra-long knee reinforcements. My only worry is the line of stitching across the middle of them. Typically, gis tear along stitch-lines so that may be an issue in the future. The taping on the bottom of the pants reprises the same taping seen on the skirt of the jacket, as well as the jacket’s sleeves and interior. It’s not scratchy at all and I had no problem with it while rolling. I loved rolling in this gi. The shorter sleeves and pants made it great to train in. I didn’t have any issues with the belt coming untied or the top coming untucked, likely because I untuck it myself most of the time. 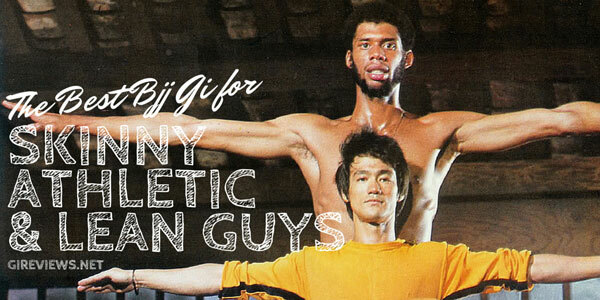 Additionally, the lightweight nature of the gi made for some fast rolling and fluid movements. I normally train with gis that are slightly heavier and all patched up so it felt like nogi class while wearing the Suparaito. 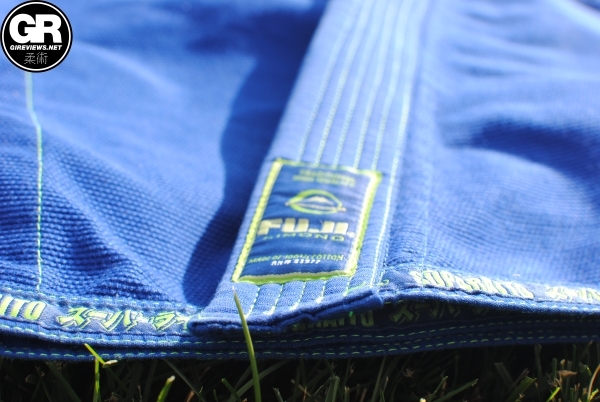 Priced at around $135, the Fuji Suparaito is a reasonably-valued BJJ gi. 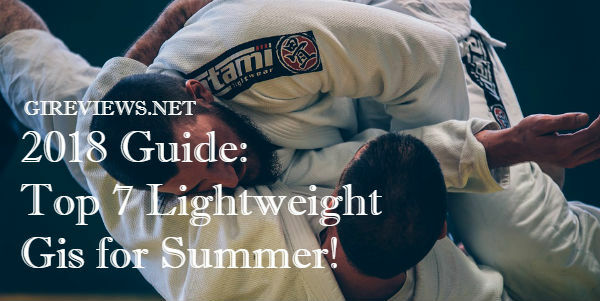 I would definitely recommend it for summer training and competitions (it is approved by the IBJJF and other organizations). A more thorough test will need to be done to see if such a lightweight gi will last the test of time, but during the review process, I had no issues with durability. Do you have a FUJI Suparaito gi? If so, leave me a note in the comments below with your thoughts on it! ARTICLE ORIGINALLY PUBLISHED OCT 21, 2014. 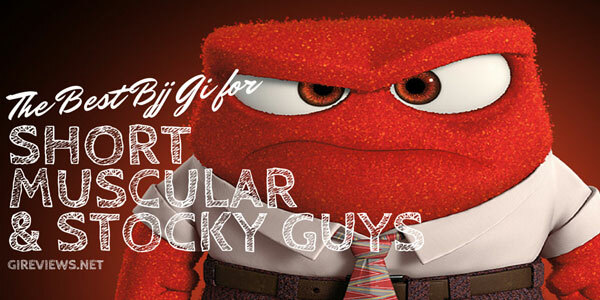 It’s a really solid gi. It’s a great gi for summer and definitely worth looking at. MAAHQ is awesome as well.